Mole Manor is used primarily for astrophotography, but it can be outfitted for visual observation. 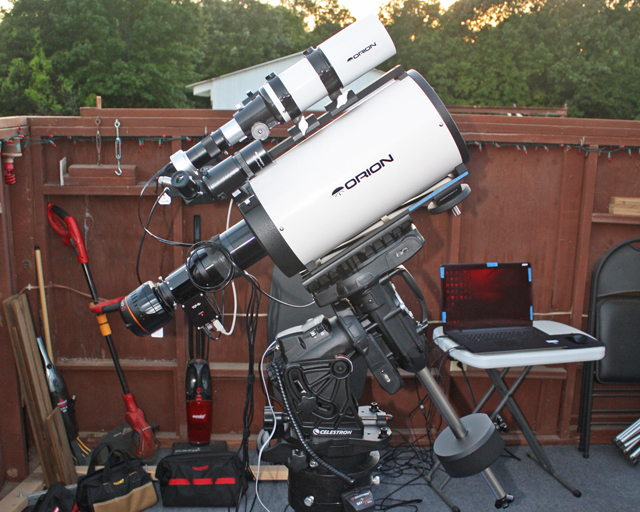 An Orion 8 inch f/8.0 Ritchey-Chrétien astrograph can be set up for deep space astrophotography. Shown attached to the back of the Ritchey-Chrétien is an Optec TCF-Si focuser and a Celestron Nightscape 8300 color camera. 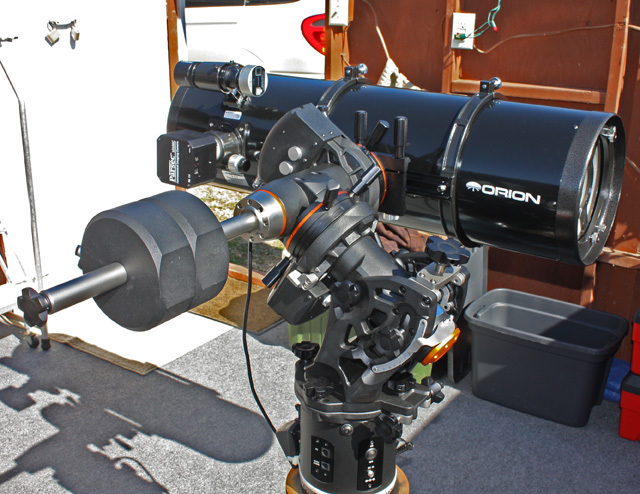 The guiding set-up is an Orion StarShoot AutoGuide camera attached to an Orion 80 mm f/5.0 Short Tube refractor. 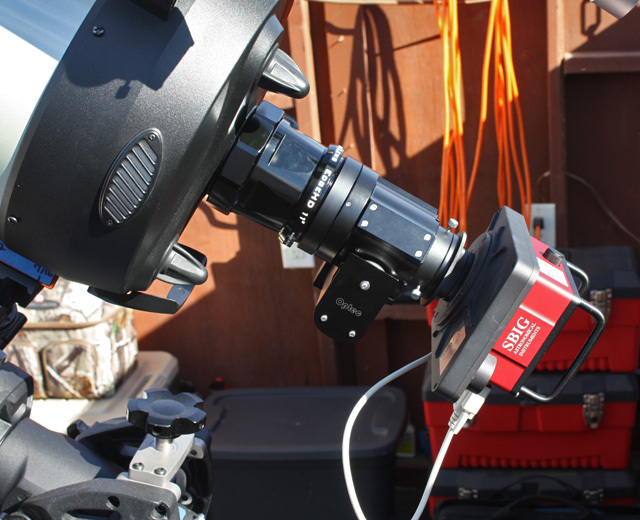 This photo shows the 8" R-C on the mount currently used in the Mole Manor Observatory, a Celestron CGX-L. In this case, the CCD camera on the Ritchey-Chrétien is an Orion Parsec 8300M monochrome camera. An Orion Nautilus filter wheel with luminance, red, green, and blue filters is used to make the exposures necessary to assemble a color image. The Ritchey-Chrétien astrograph or a Schmidt-Cassegrain astrograph can be configured with a video camera for planetary astrophotography. This photo shows the Ritchey-Chrétien astrograph with a Point Grey Flea 3 video camera. A Barlow is usually added to provide additional magnification. The video frames from the video camera are recorded on a laptop PC and processed later to produce a single image. No guide scope is needed for planetary astrophotography. For wide field deep space astrophotography, a William Optics 71 mm f/4.9 STAR71 refractor can be set up with a CCD camera and a guide scope. 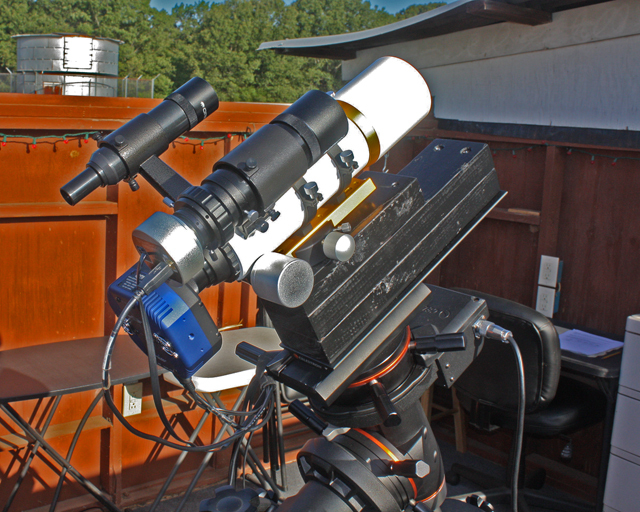 This photo shows the William Optics 71 mm refractor and the QSI 683cs color camera. The guide set-up is a StarShoot AutoGuide camera on an Orion 50 mm f/3.2 Mini Guide Scope. A wooden fixture was fabricated so that the light wide field set-up could be balanced on a mount designed for heavier equipment. 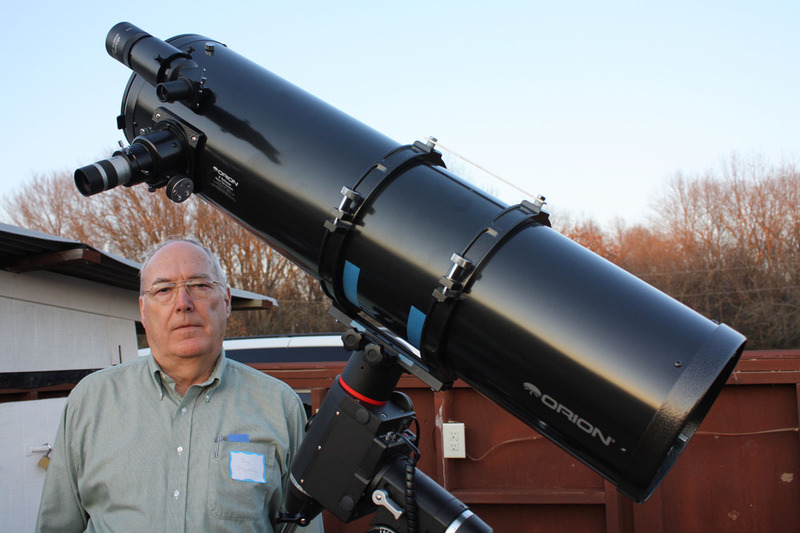 An intermediate field of view and more light gathering capability are provided by an Orion 10 inch f/3.9 Newtonian Astrograph. This photo shows the Newtonian being set up with a Baader Planetarium coma corrector and an Orion Parsec 10100C color camera. The guide set-up is the StarShoot AutoGuide camera on the Orion Mini Guide Scope. A narrow field of view for astrophotography is provided by a Celestron 11 inch f/10.0 Edge HD Schmidt-Cassegrain telescope/astrograph. The Schmidt-Cassegrain is shown here with the Optec TCF-Si focuser and the QSI 683cs color camera. 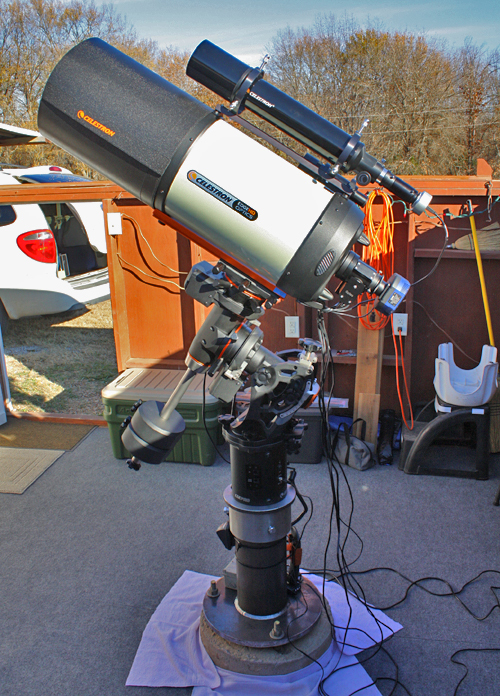 The guiding set-up is an Orion StarShoot AutoGuide camera on a Celestron 80 mm f/7.5 refractor. 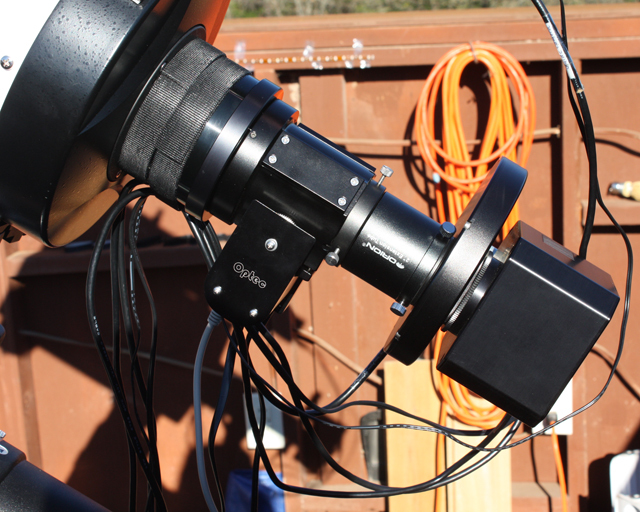 This photo shows the Schmidt-Cassegrain mounted on a Celestron CGE Pro mount on the Mole Manor Observatory pier. A focal reducer can be used to change the Celestron 11 inch Edge HD Schmidt-Cassegrain telescope/astrograph from f/10.0 to f/7.0. This shortens the focal length and widens the field of view. This photo shows the Schmidt-Cassegrain with the 0.7x focal reducer, the Optec TCF-Si focuser, and an SBIG STF-8300M monochrome camera and filter wheel. A laptop PC running MaxIm DL is used to control and monitor the telescope, CCD camera, and guide camera and to download the astrophotos from the CCD camera. 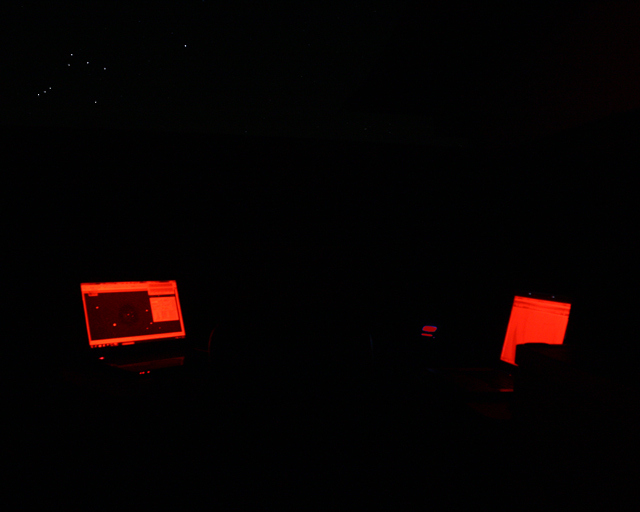 A second laptop PC runs the Starry Night planetarium program in real time and contains planning files and photos. A red filter is placed over each PC screen during nightime operation. The Orion 10 inch f/3.9 telescope/astrograph can be used for visual observation. This photo shows the 8 inch Orion f/4.0 Newtonian that was the first telescope used in the observatory. 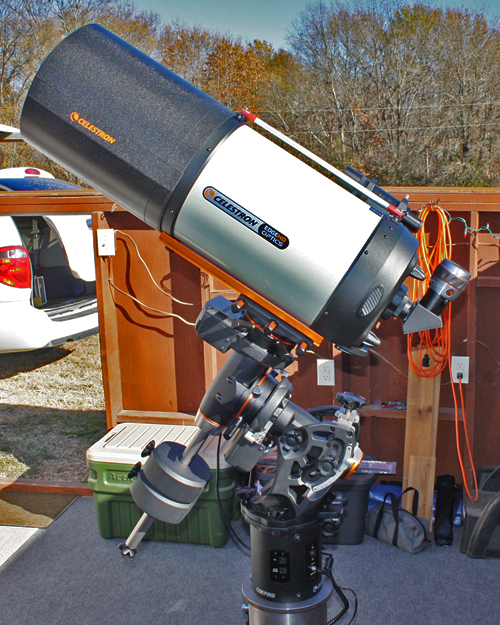 An Astro-Tech 72 mm f/6.0 refractor can be used for wide field visual observation. The Celestron 11 inch f/10.0 Edge HD Schmidt-Cassegrain telescope/astrograph gives high visual magnification with a relatively narrow field of view.